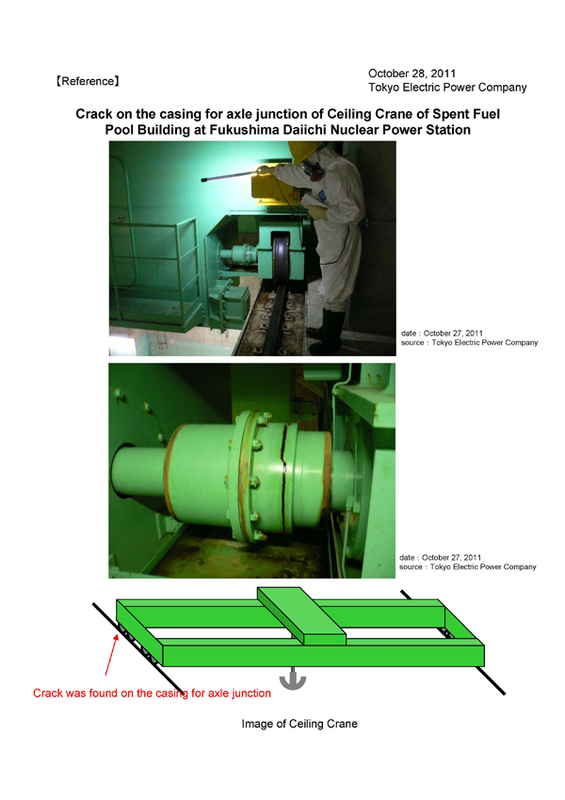 In Fukushima Daiichi nuclear power plant, the fuel pool buildings that have a 6375 store spent fuel from Unit 1 Unit 6, 27, crane inspection work has been done to retrieve the fuel used. At that time, have found places for about 5 1 mm wide cracks in the steel axle connecting portion 25 centimeters in diameter at the wheel of the truck to support the crane. TEPCO is looking into taking a look and cracked axle load on the connecting portions of the earthquake in March. In the reactor building crane, when the Niigata Chuetsu-oki Earthquake in 2007 four years ago, three locations have been found in damage to the axle of the truck to the Kashiwazaki-Kariwa nuclear power plant in the same way. TEPCO plans to begin work on retrieving the fuel from the fuel pool of the Fukushima Daiichi nuclear power plant reactor building within three years, then consider using a crane to retrieve the fuel from the fuel pool in this building before it Because the future, and to promote or replace parts.